To Cite: Ghaffari S, Aslanabadi N, Kazemi B, Ghojazadeh M, Azami-Aghdash S, et al. Prevalence, Risk Factors, and Outcome of Myocardial Infarction with Angiographically Normal and Near-Normal Coronary Arteries: A Systematic Review and Meta-Analysis, Int Cardio Res J. 2016 ; 10(4):e9802. Context: Coronary artery diseases are mostly detected using angiographic methods demonstrating arteries status. Nevertheless, myocardial infarction (MI) may occur in the presence of angiographically normal coronary arteries. Therefore, this study aimed to investigate the prevalence of MI with normal angiography and its possible etiologies in a systematic review. Evidence Acquisition: In this meta-analysis, the required data were collected from PubMed, Science Direct, Google Scholar, Scopus, Magiran, Scientiﬁc Information Database, and Medlib databases using the following keywords: “coronary angiograph”, “normal coronary arteries”, “near-normal coronary arteries”, “heart diseases”, “coronary artery disease”, “coronary disease”, “cardiac troponin I”, “Myocardial infarction”, “risk factor”, “prevalence”, “outcome”, and their Persian equivalents. Then, Comprehensive Meta-Analysis software, version 2 using randomized model was employed to determine the prevalence of each complication and perform the meta-analysis. 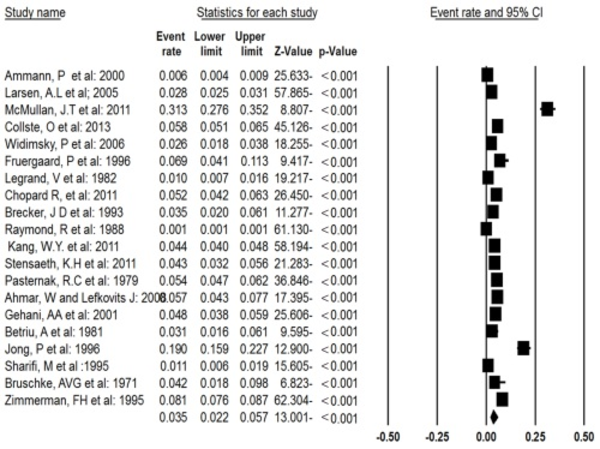 P values less than 0.05 were considered to be statistically significant. Results: Totally, 20 studies including 139957 patients were entered into the analysis. The patients’ mean age was 47.62 ± 6.63 years and 64.4% of the patients were male. The prevalence of MI with normal or near-normal coronary arteries was 3.5% (CI = 95%, min = 2.2%, and max = 5.7%). Additionally, smoking and family history of cardiovascular diseases were the most important risk factors. The results showed no significant difference between MIs with normal angiography and 1- or 2-vessel involvement regarding the frequency of major adverse cardiac events (5.4% vs. 7.3%, P = 0.32). However, a significant difference was found between the patients with normal angiography and those with 3-vessel involvement in this regard (5.4% vs. 20.2%, P < 0.001). Conclusions: Although angiographic studies are required to assess the underlying etiology of MI, physicians facing patients presenting with the clinical features of MI in presence of normal or near-normal coronary arteries should consider the prevalence and risk factors of MI with normal or near-normal coronary arteries. Myocardial Infarction (MI) is one of the main causes of mortality and morbidity worldwide. Coronary atherosclerosis is composed of stable and unstable periods (1). During unstable periods with activated inflammation in the vascular wall, patients may develop MI (2). MI may be a negligible incident in a lifelong chronic disease or may even be noticed. It may also be a life-threatening disastrous event leading to sudden death or severe hemodynamic instability (3). Coronary artery diseases are mostly detected using angiographic methods demonstrating arteries status. Nonetheless, MI may occur in the presence of angiographically normal coronary arteries (4, 5). In fact, 2.6 - 12% of patients who undergo coronary angiography because of MI with suspected ischemic heart disease are found to have nearly normal coronary arteries in angiography (6, 7). The prognosis of normal coronary arteries with suspected signs and symptoms of ischemia is not really benign as reported by previous studies and as commonly assumed by physicians (8, 9). Although clinical presentation and outcome of MI may provide some insights, it is too subjective to diagnose individual patients and estimate prognosis. A variety of questions are relevant to evaluation and therapeutic clinical decision-making in patients with angina and normal coronary arteries (10). According to the literature, many factors, such as hypertension, smoking, diabetes, prothrombotic tendency of blood, and myocarditis, were associated with angina accompanying normal coronary arteries. However, not all these factors have been approved in different studies. Also, prognosis of MI with normal coronary artery angiography has been a subject of controversy (11). Considering what was mentioned above, understanding the etiologies and estimating the incidence and prevalence of MI with normal angiography can help physicians reveal more about the pathophysiology of this condition and detect its risk factors. This would eventually lead to selection of the best approach for patients as soon as possible. This study aimed to investigate the prevalence, risk factors, and outcome of MI with normal angiography in a systematic review. 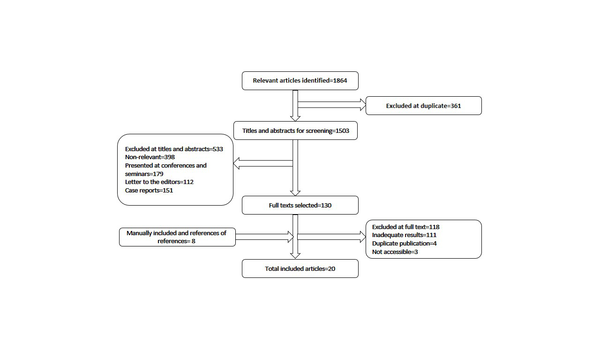 This systematic review and meta-analysis was conducted in 2015 using the systematic review approach adopted from the book entitled “A Systematic Review to Support Evidence-Based Medicine” (12) and according to the Preferred Reporting Items for Systematic Reviews and Meta-Analyses (PRISMA) checklist (13). All the articles published in English and Persian that had reported sample size and prevalence of normal or near-normal coronary arteries between 1975 and 2015 were included in the study. On the other hand, the articles that had only reported non-cardiac chest pain, conference presentations, case reports, and interventional and qualitative studies were excluded from the analysis. 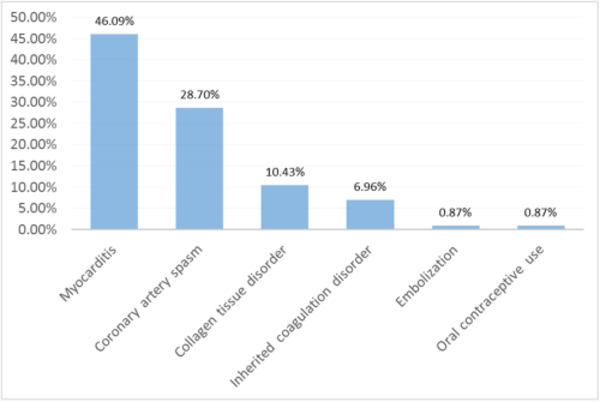 The required data were collected by searching PubMed, Science Direct, Google Scholar, Scopus, Magiran, Scientiﬁc Information Database (SID), and Medlib databases using the following keywords: “coronary angiograph”, “normal coronary arteries”, “near-normal coronary arteries”, “heart diseases”, “coronary artery disease”, “coronary disease”, “cardiac troponin I”, “myocardial infarction”, “risk factor”, “prevalence”, “outcome”, and their Persian equivalents. Some relevant journals and databases were also searched manually. Reference lists of the selected articles were checked, as well. In the first phase of the review process, an extraction table was designed including the first author’s name, article’s publication year, country, survey time (year), sample size, prevalence of normal or near normal coronary arteries, sample’s mean age, percentage of male participants, and risk factors of normal or near-normal coronary arteries. The Major Adverse Cardiac Events (MACE) were defined as death, Q-wave MI, and need for repeated revascularization by redo-Coronary Arteries Bypass Grafting (CABG) or repeat percutaneous intervention. Additionally, normal angiography was defined as normal appearing intima, while near-normal angiography was defined as intimal irregularity without obstructing atheroma. The validity of the data extraction table was confirmed by experts. A pilot study was also conducted (on 5 articles) for further improvement of the extraction table. It should be noted that two authors (N. B. M. and A. A. S.) who had sufficient experience and knowledge were responsible for independent extraction of the data. In the first phase of articles selection, the articles with non-relevant titles were excluded. In the second phase, the abstracts and the full texts of the articles were reviewed to include those that met the inclusion criteria and had appropriate methodologies. Endnote X5 software was used to organize and assess the titles and abstracts and to identify duplication of articles. Besides, Excel 2010 software was used to draw the graphs. Two reviewers (N. B. A. and K. B.) evaluated the articles according to the checklist of Strengthening the Reporting of Observational Studies in Epidemiology (STROBE) (14) (Appendix 1). Accordingly, the articles acquiring 75% of the total score were included. Controversial cases were discussed by the reviewers and in case no agreement was obtained, they were referred to a third reviewer (Gh. S.). To estimate the overall prevalence of MI with normal or near-normal coronary arteries, Comprehensive Meta-Analysis (CMA) software, version 2 (Englewood, NJ, USA) was used. In addition, forest plot was applied in order to report the results. In the forest plot, the size of each square shows the sample size and lines on each side of the square show the Confidence Interval (CI). The prevalence of normal and near-normal coronary arteries was calculated based on the random effects model with 95% CI. Funnel plot was also implemented to evaluate the possibility of publication bias. Heterogeneity was detected using I2 and P value. If I2 was more than 50% and P value was equal to 0.05, the random effects model was used. It should be mentioned that P values less than 0.05 were considered to be statistically significant. The initial search resulted in 1864 articles. After excluding the irrelevant articles, those with weak applicability to the study, duplicated articles, and those matching the exclusion criteria, 20 articles were enrolled into the study. The process of articles inclusion and exclusion has been depicted in Figure 1. Besides, the characteristics of the evaluated articles have been presented in Table 1. The results of the extracted data from the enrolled articles have also been summarized in Table 1. Accordingly, most of the studies were conducted in the U.S. In addition, 139957 patients were studied in the 15 included studies performed during approximately 66 years and a month. The mean age of the patients was 47.62 ± 6.63 years (range: 40 - 60 years) and 64.4% of the patients were male. zAbbreviations: ACS, Acute Coronary Syndrome; AMI, Acute myocardial infar-ction; CAD, Coronary Artery Disease; MI, Myocardial Infarction; STEMI, ST-elevation myocardial infarction. Considering the high variation in the results of the studies, random effects model was used to determine the prevalence of normal and near-normal coronary arteries (Figure 2). Accordingly, the prevalence of MI with normal or near-normal coronary arteries based on the random effects model was 3.5% (CI = 95%, min = 2.2%, max = 5.7%; Q value = 2540.9, I2 = 99.2, df = 19, P < 0.001). At this stage, the studies by McMullan, J. T. et al. (2011) and Jong P et al. 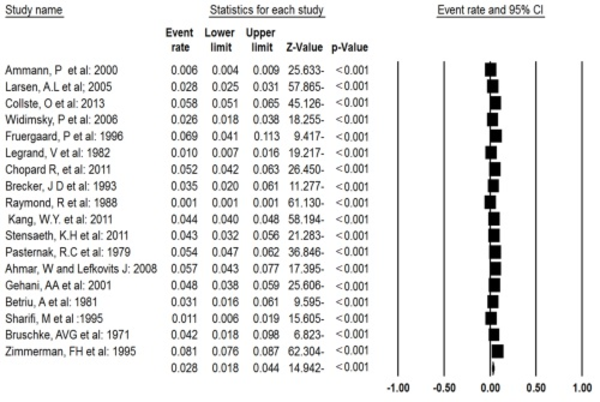 (1996) were excluded from the meta-analysis due to being outliers and the analysis was repeated. 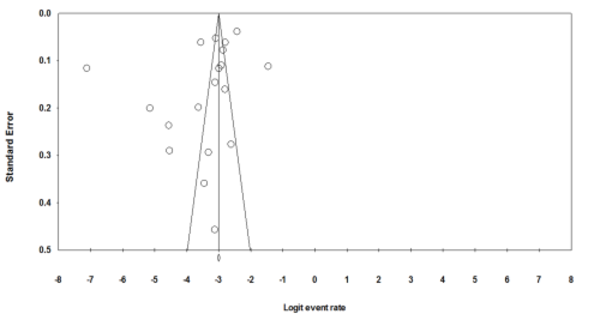 The results have been presented in the forest plot (Figure 3). Accordingly, the prevalence of MI with normal or near-normal coronary arteries was 2.8% (CI = 95%, min = 1.8%, and max = 4.4%; Q-value = 1760.9, I2 = 89.3, df = 17, P < 0.001) (Figure 4). Large standard errors are indicative of a small sample size. A logit event rate that is positive in sig n corresponds to an actual event rate that is larger than 0.5 (50%), and vice versa. To evaluate the publication bias, funnel plot was applied (Figure 3). The results of this funnel plot showed the possibility of publication bias among the studies. 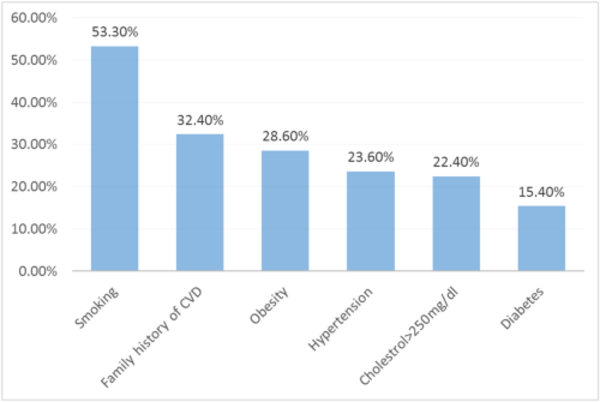 Based on the studies included in the analysis, smoking, hypertension, diabetes, family history of cardiovascular disease, obesity, and cholesterol > 250 mg/dL were the most important risk factors of MI with normal or near-normal coronary arteries (Figure 5). The risk factors of MI with normal or near-normal coronary arteries have been depicted in Figure 5. Accordingly, smoking (Odds ratio = 2.34; 95% CI = 2.27 - 2.41) was the most important risk factor. Moreover, the final diagnoses and possible etiologies of MI with normal or near-normal coronary arteries have been illustrated in Figure 6. As the figure depicts, myocarditis was the most common diagnosis. Furthermore, 696 patients were followed up for at least 1 year and MACE (15-17, 25, 32), including cardiac death, MI, CABG, revascularization, and percutaneous angiography, were investigated. Based on the findings, 38 patients (5.4%) had experienced MACE. Control groups were also considered in these studies, including patients with MI and abnormal angiographic characteristics (17394 patients). The results revealed no significant difference between MIs with normal angiography and 1- or 2-vessel involvement regarding MACE frequency (5.4% vs. 7.3%, P = 0.32). However, a significant difference was observed between the patients with normal angiography and those with 3-vessel involvement in this regard (5.4% vs. 20.2%, P < 0.001). In the present study, the prevalence of MI with normal or near-normal coronary arteries was 3.5%. Besides, the risk factors attributed to MI with normal or near-normal coronary arteries were smoking, ypertension, diabetes, family history of cardiovascular disease, obesity, and cholesterol > 250 mg/dL. A previous study was conducted on 1150 patients with ST-segment elevation MI among whom, 625 coronary angiograms were performed within 2 hours of the initial electrocardiogram (ECG). In that study, the frequency of normal coronary angiography was 2.6% in the patients presenting with acute MI and ST elevations. Except for MI, most of these cases were not diagnosed properly. Additionally, normal angiograms during a biochemically confirmed infarction were extremely rare (0.7%) and were not detected during the ongoing symptoms of ischemia (19). These results were similar to those of the current study. A similar study including 9,796 patients who had undergone coronary angiography with acute MI also disclosed that 273 patients had angiographically normal coronary arteries. These patients were younger and less likely to have traditional risk factors for atherosclerosis, such as hypertension, hyperlipidemia, and diabetes mellitus, compared to those with documented coronary diseases. In addition, only 4.4% of the patients were above 75 years old and 39.6% were below 45 years of age, which indicated the tendency of this situation in lower ages. Moreover, smoking and hypertension were the most important risk factors (16), which is in agreement with the findings of the present study. In another study investigating MI with normal coronary arteries in 4801 patients, 4412 subjects (92%) underwent in-hospital coronary angiography 277 of whom (6%) were found to have normal arteries or minimal atheromatous on coronary angiography. Besides, being a prior smoker was a more important risk factor than present smoking and treated hypertension was the next important risk factor (18). Although prior or present smoking and treated or untreated hypertension were not specified in the present study, both were important risk factors. In one other study investigating the clinical characteristics of suspected ST-segment elevation MI and normal coronary arteries, 49 out of the 1,145 patients with suspected ST-segment elevation MI had completely normal coronary arteries and were entered into a prospective registry. In that study, 90% of the patients were male; therefore, male gender can be mentioned as a major risk factor. Family history of coronary artery disease, hypertension, smoking, and recent respiratory tract infections were factors (26). The above-mentioned risk factors, except for male gender, were consistent with those reported in the present study. In our study, various mechanisms, including myocarditis, coronary spasm, acquired or inherited coagulation disorders, embolization, and connective tissue diseases, were proposed to explain MI with normal or near- normal coronary arteries. A previous study concluded that undergoing ergonovine maleate test was the most common etiology of MI with normal or near-normal coronary arteries, such a way that coronary artery spasm was diagnosed in 30% of such patients (35). Considering the outcome among the patients with MI with normal or near-normal coronary arteries, the current study results indicated a difference between the patients with low risk of MI (1- or 2-vessel disease) and those with normal angiography regarding the prevalence of MACE. However, the prevalence of MACE was significantly lower in the patients with 3-vessel disease compared to those with normal angiography. This is in contrast to a study investigating long-term prognosis of MI with normal coronary angiogram. The results of that study demonstrated that although mortality rates were not affected by the involvement pattern, morbidity was lower in the MI patients with normal coronary angiography compared to those with significantly involved coronary arteries (35). One of the main limitations of this study was not estimating the relative risks and odds ratios. Thus, the correlation between different risk factors of MI with normal or near-normal coronary arteries could not be compared and just a descriptive report was provided. Another study limitation was restriction of the languages used for inclusion of articles. Increasing the number of languages could enhance the quality of the research by increasing the number of eligible studies. In conclusion, although angiographic studies are required to assess the underlying etiology of MI, these kinds of studies are sometimes unable to reveal the underlying obstruction or other affected arteries. Hence, considering risk factors, such as smoking, hypertension, diabetes, family history of cardiovascular disease, obesity, and cholesterol > 250 mg/dL, may remind emergency room physicians to think of the possibility of MI with normal or near-normal coronary arteries. This study was supported by Tabriz University of Medical Sciences. This article is resulted from a thesis registered at Tabriz University of Medical Sciences, Tabriz, Iran with number of 92/3 - 4/7. Authors’ Contribution: Study concept and design: Samad Ghaffari, Naser Aslanabadi, Ali Naghavi-Behzad; acquisition of data: Ali Naghavi-Behzad, Mohammad Naghavi-Behzad, Reza Piri; analysis and interpretation of data: Saber Azami-Aghdash, Reza Piri; drafting of the manuscript: Ali Naghavi-Behzad, Farid Karkon-Shayan, Reza Piri; critical revision of the manuscript for important intellectual content: Samad Ghaffari, Naser Aslanabadi, Babak Kazemi, Mohammad Naghavi-Behzad; statistical analysis: Saber Azami-Aghdash, Reza Piri; administrative, technical, and material sup p ort: Ali Naghavi-Behzad, Farid Karkon-Shayan, Mohammad Naghavi-Behzad; Study sup ervision: Samad Ghaffari, Naser Aslanabadi. Funding/Support: This study was supported by Tabriz University of Medical Sciences. Implication for Health Policy/ Practice/ Research/ Medical Education: Coronary artery diseases are mostly detected using angiographic methods demonstrating arteries status. Nevertheless, Myocardial Infarction (MI) may occur in the presence of angiographically normal coronary arteries. Therefore, this study aimed to investigate the prevalence of MI with normal angiography and its possible etiologies in a systematic review.